Resigning from a job that’s been making you unhappy can feel like a huge weight off your shoulders as you prepare for fresh challenges in pastures new. Our guide to effective resignation will help you to say goodbye with dignity and professionalism. The decision to resign isn’t one to be made at the end of a hectic day, or after a heated discussion in the boardroom. This is a potentially life-changing move, so think about it with a cool head. Consider the practicalities of leaving your job, particularly if you haven’t another lined up. If necessary can you survive without and income, and for how long? The feeling of freedom from the shackles of work will soon pale into insignificance when you’re struggling to keep the wolf from your door a few months down the line. Sometimes desperate times call for extreme measures, but if you can, line up another job before you jump ship. Writing a resignation letter can be a daunting task. However bitter and miserable you might have been in your job, this isn’t the right time to address bad feeling. Save candid comments for your exit interview! Instead, give your letter a positive feel by thanking your employer for the opportunities you‘ve been given and the skills you’ve developed during your employment. It’s critical that you don’t burn your bridges when you resign – remember you’ll need a reference from your manager, and this being the small world that it is, you’re likely to come across old colleagues elsewhere in your career. Remember also to clearly state when you’ll be leaving. 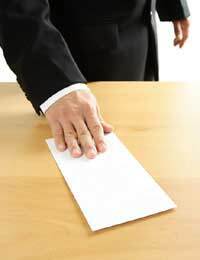 It’s always best to hand in your resignation in person, if possible. Schedule a meeting with your manager and prepare what you want to say well ahead of time. During the meeting reassure your boss that you’ll continue to put in 100%, and that you’ll do everything possible to ensure a smooth handover. Be ready for a range of reactions from your boss, just in case emotions run high. As in your letter, explain that you’re very grateful for the experience and that you wish the team and company every success in the future. You may find yourself with a counter-offer in your hand, and it’s worth thinking about this eventuality ahead of time. Keep in mind the reason why you want to leave, and assess any alternative offer against this. If the frustrations that have driven you to resign will crop up in the alternative role, it may be best to politely decline. A counter-offer is a compliment to your ability and contribution to the company, so take a moment to feel proud of yourself! So you’ve breezed through your notice period with barely a care in the world and a spring in your step. Your last few days should be spent tying up any loose ends and making sure you’ve completed your handover. Make sure you seem to be dedicated to the last, even if you’ve been somewhere else mentally for the last four weeks. Remember to be gracious and thank managers and colleagues for their support and friendship. Finally, enjoy the feeling of letting go and look forward to new beginnings.